I thoroughly enjoyed Ken Follett’s epics, “Pillars of the Earth” and “World Without End”. Though they are hefty tomes, the pages flew. 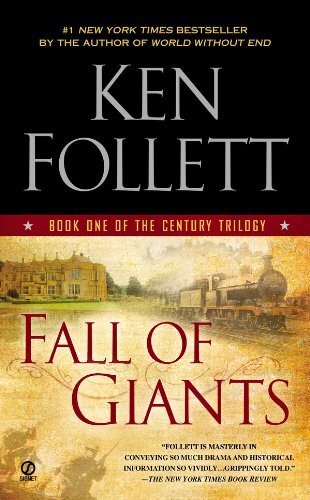 Thus I jumped at the chance to read and review Follett’s latest epic, “Fall of Giants” which promises to be the first in The Century Trilogy. When it arrived from Amazon at ~1000 pages and 4 inches thick, I found myself contemplating one of the advantages of having a slim Kindel (I don’t). When the thing comes out in hardback in September it could be used a murder weapon! In past reviews I have criticized authors that I believe would benefit from more editing (e.g., Steven King, John Irving) so why don’t I find Follett’s book to be too long? Because there are no slow spots, no political point pushing, and no self-indulgent purple prose. I learned a great deal about WWI reading this novel, what led up to it and how it set the stage for WWII, which I hope is the subject of the next volume. It was fascinating to read about how the media and the governments of all the countries involved, lied to their people about how bad it was. One other thing that I believe readers should know going in: as mentioned, this is Part One of a promised trilogy but, like “Pillars” and “World” it is a stand-alone novel. The reader is not left gripping a cliff at the end. I recently very much enjoyed Connie Willis’ “Blackout” which DOES end with a cliff hanger and I am glad I knew that going in; some readers didn’t and felt cheated. You will not feel at all cheated at the end of “Fall of Giants”. Enjoy! Although Fall of Giants is about World I and circumstances leading up to the start of the war, it is primarily about everyday people. There is the Williams family—young Billy Williams is going to the coal mine for the first time—and his Sister Ethel, who works at the house of Earl Edward Fitzherbert (Fitz) of Aberowen (a fictional Welsh town). Fitz, a conservative, is married to Bea, a Russian Princess and his a sister Maud who has very liberal views. Maud falls in love with Walter von Ulrich, a German nobleman and a former schoolmate of Fitz’s. We are also introduced to the Peshkov orphans from Russia, who work in a locomotive factory, and hold a personal grudge against Princess Bea for the murder of their parents. We meet Gus Dewar, who is a close adviser to President Woodrow Wilson. Although it is a work of fiction and we find the lives of these characters intertwining as the cause of the First World War is explained and WWI is declared, historical facts are linked in the telling of the collapse of Imperial Russia (Lenin’s role in the rise of the Bolsheviks) and Germany’s role in the bloody war that led to Europe’s economic collapse and the rise of Hitler. The novel also devotes several chapters on women’s rights (suffrage) in Britain. Mr. Follett shows us the devastation caused by the war and of the suffering of the soldiers in the trenches and the thousands who are killed in action while the politicians hide the real facts from the masses. We find the characters and their extended families trying to survive in the world they find themselves in, the quality of life, health, and education. The effects of the First World War are brought out vividly as these characters interact with each other, and their fortunes change some for better, others for worse. I rarely read books this long as I am a slow reader. This story was so compelling, so many sets of characters from different countries (primarily Great Britain, Germany, Russia, France and the US) that I read it fairly quickly. The story line follows the developments of World War 1 from its start to finish. While I thought I knew the outcome, I had never understood this war at all. This book gave me a much better understanding of that time in history (even gave me an understanding of the Russian revolution) all without feeling like I was reading a history lesson. It was exciting, exhilarating, depressing, confusing, sad and joyful – I can honestly say, never a dull moment. The characters are great. Many strong women characters, at odds with their times. Gives a good understanding of class distinctions in England, and how these were somewhat obliterated by WW1. Just a well written interesting, and sometimes challenging read. I thoroughly enjoyed it and plan to read the second part of the Century Trilogy by Follett.